The wood blewit is a mushroom one would be hard-pressed not to notice. Wood blewit grabs the eye with its violet, fleshy cap, which is initially bell-shaped but eventually flattens out. Common edible and poisonous mushrooms found around the world. Analyze the different mushrooms and learn how to recognize them. 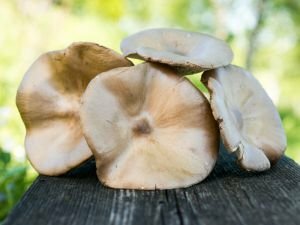 These articles on mushrooms are of an informative nature only. The oyster mushroom also appears in early spring. Oyster mushrooms prefer deciduous forest clearings and grows most intensively in rainy weather toward the end of fall before the snow. Sweet tooth flesh is fit for consumption. Sweet tooth can be added to various oven baked dishes, stews and soups. Use of sweet tooth is highly popular in French cuisine. In vegetarian cuisine, chicken of the woods is used as a substitute for chicken meat. Chicken of the woods is suitable for frying, marinating, boiling, breading. Russula is a genus of the Basidiomycota division, belonging to the Russulaceae family. The green-cracking Russula is common in deciduous forests. It is found near beeches and oaks, sometimes around birch as well. Truffles are underground mushrooms that have no stem and root. Types of truffles. Selecting and storing truffles. Benefits of truffles. Common Morel /Morchella esculenta/ is a delicious mushroom. Common Morel is of German origin. The hood of a Common Morel is an extended-cumulus or cumulus. Common Marasmius oreades is a kind mushroom that is very common in Eastern Europe. Marasmius oreades are tasty mushrooms that can be found in markets and shops. Suillus is a kind of mushroom. Types of suillus. Collection and storage of Suillus. Suillus are widely used in cooking. Mushrooms are high in water and therefore are low-calorie food. There are about 12000 species of mushrooms. Selecting and storing mushrooms.